Tell me your opinion: Does your opening line lead in solidly to the rest of your story? @Julie: I bet you have, and you just didn’t notice. They’re more common than you might think. But, most of the time, we don’t consciously realize what’s happening when that first line lies to us, especially if the author quickly clears up the confusion. @Raquel: The writing life is full of temptations, isn’t it? Think how easy writing that first draft would be if we allowed ourselves to take all these shortcuts. But the second draft… oy vey! I utilize dreams and visions as important elements in the story but I try to refrain from pulling the switch. It’s a delicate balancing act but consistency with purpose prevents it from feeling like a switch. I never lead with a vision or dream as hook. It takes quite a bit of refinement though. Dreams and visions absolutely have their place in fiction. As long as they’re not being used to manipulate the reader in a way that will leave him feeling cheated, they’re often useful techniques. Great post! I’m sorry to say that I started with a dream – first draft. Then I got smacked around a bit by a critique group and that’s been replaced by something that connects solidly with the rest of the story. We’re allowed all kinds of mess-ups in the first draft. Dreams are a common mistake – probably because we see the movies get away with them so often. Fortunately, they’re usually one of the first things a good critique partner will catch. excerpts of this are showing up everywhere in the book, and it ties into the mystery of the book and, like I said, so or acts as a sound board for the books themes. If the line of dialogue carries weight within the story itself, you can probably safely get away with it – as long as you immediately make readers aware that it’s an excerpt from a book within the story. With the unquestioning acceptance of the bizarre that comes only in dreams, I take the bowl from the woman in white robes and drink its contents. Is this permissible, do you think, or will my novel be in the agent’s bin before getting to the second line? I’m also not sure about starting a book with the word ‘with’. I’m about three quarters of the way through my first draft (though I started it during Nanowrimo 2016 and didn’t pick it up again until recently, so have re-read and second drafted the first 56K words) and am in the process of thinking about Beta readers, which is how I found myself on your wonderfully informative site so late in the day. I hope you still get to see this and give me some advice. Unless the protagonist immediately wakes up in the next sentence, as a reader, I would have some resistance to this opening. I would feel like it was taking too long to get me to the actual action of the scene. Thanks so much for replying – I hardly expected it four years after the last post! Unfortunately, it doesn’t end there. Without going into too much detail, the two page vision is the start of an increasingly weird day, by the end of which she has to suspend her disbelief in the reality of magic if she’s to save her friends’ lives, something that’s difficult for a 16 year old empiricist intent on becoming a surgeon. The vision is integral to the story, and things she sees in it foreshadow events later in the book. I’m just not sure how to start with the vision, without lying to the reader, hence the reference to the dream in the first line. Is your issue, as a reader, with the fact that it’s not immediately into the action, or that it’s not fully clear it’s a vision…or both? 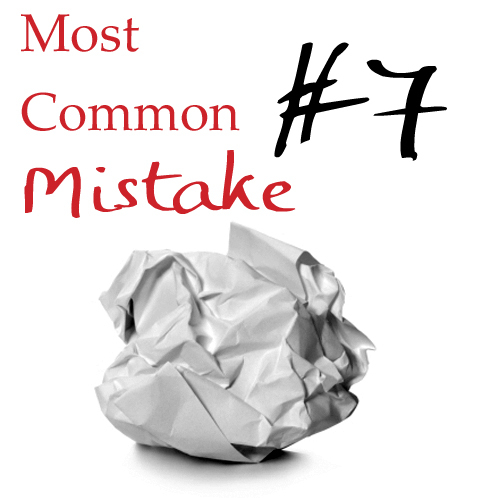 I’ve spent the entirety of yesterday and this morning reading all your ‘most common writing mistakes’ (when I should have been writing, but it’s been time extremely well spent! ), and I now think I’m going to have to give the first few chapters an overhaul. Thanks again for replying to me; it’s gracious of you to take time out to redirect a meandering amateur. The inherent problem of dream openings (and often dreams in general) is twofold. One is that readers can feel lied to if they do not know what they’re experiencing is a dream. The second issue is that most dream sequences lack stakes. Readers understand this isn’t real and therefore whatever the character’s goal (assuming they have one) and whatever conflict is opposing that goal–it simply doesn’t matter. It’s not real; it’s just, at best, symbolic. Usually, dreams work best when they’re very short and used more as teases or hooks that foreshadow new reveals in the real time of the plot. Bottom line: they need to directly move the plot. Otherwise, they can come across as info dumps. Thanks for replying once more. I’ve taken your advice to heart and spent the day doing a complete overhaul of my plot, with not a dream or vision now in sight. Other things you’ve covered have made me realise there’s an awful lot of filler in my story, which, whilst I loved writing it, is not necessary to move the plot forward. I have a tonne of revision ahead but at least you’ve saved me from wasting months finishing a book that is never going to be readable by anyone except immediate family. Thank you, I’m most grateful. Glad to be of help, Janet! In regards to moving the plot, you might also find this post helpful: Top 10 Ways to Rivet Readers with Plot Reveals. Anyway, the book starts with what seems like a bit of medias res – detective in the rain at a crime scene when up walks the victim’s mother. And then it’s still raining, but the detective is in his room trying ignore his cell phone. Unfortunately, the call is related to his dream – it looks like old haunts are coming back into play. Because the dream is more of flashback and it ties directly into the action and the story is it still a “trick” or no? If it’s short, a good hook, and doesn’t fool readers by pretending to be real, it could be made to work. If you had a preface that takes place later in the book in your opening, would that be considered “lying to your readers”? It shows a vague clip of what happens later so that readers will keep reading, and eventually the book will tie back in to that. No, that’s called a flash-forward. That technique is not a lie, as long as the impression it’s giving readers is true.